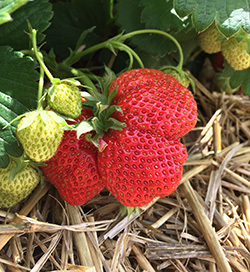 PLEASE NOTE the fields will open for picking at the end of May 2019. Sign up to our email so we can let you know when the fruit season begins. Whether it’s your first time picking your own fruit or you come every year, we hope to make your visit to the farm easy and enjoyable. Start your visit to at the farm shop: staff will be on hand to direct you to the best areas to pick that day, and weigh your empty containers. You don’t need any special equipment for your visit. Containers suitable for all crops are available in the shop, or you’re welcome to bring your own. 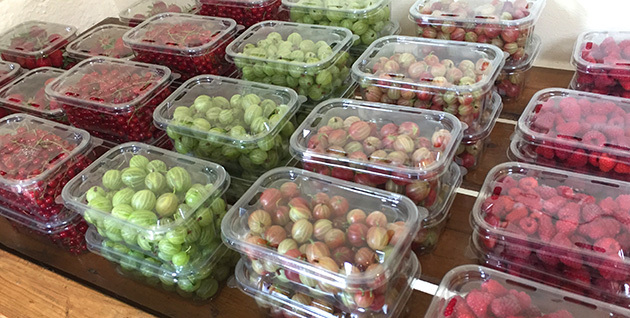 Freshly picked fruit is available in high season, for those who are short of time. Arrive early to ensure you don’t miss out! Alternatively, contact the farm shop to check availability and place an order. The farm shop stocks local produce including potatoes from a neighbouring village and cream from a local dairy. Freshly frozen fruit is also available throughout the year. We accept debit and credit cards when spending over £5. The farm is open 9am – 6pm, seven days a week. The farm is at 53 Straight Road, Boxted, near Colchester, Essex in the UK. The postcode is CO4 5RB. By car: The farm is about 10 mins drive from Colchester, Highwoods, and the A12. Take junction 28 from the A12 for easiest access. The farm is on well signposted on Boxted Straight Road, between Fillpots Garden Centre and Queens Head Road. Public transport: the village bus service runs from Colchester via the train station and hospital. It stops just outside the farm. Parking: There are two large grass car parks next to the farm shop. Toilets: There is a toilet at the rear of the farm shop (not wheel-chair accessible). Wheelchair access: The farm is flat with grass paths between the crops but the ground is often uneven. Safety: Please do not smoke beyond the car park. We provide buckets of sand for disposing of lit cigarettes. Dogs: due to food safety regulations, dogs are not permitted on the farm.